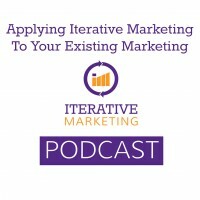 There are four areas to apply Iterative Marketing to your existing marketing, without starting from scratch. They are through Discovery, Setup, Reporting and Iteration. Discovery is laying the groundwork. Make sure you have a defined and documented brand, vision and target audience. Most importantly, develop a persona for the key decision maker in a majority of your sales. Reference our B2B and B2C buyer persona templates and customer journey map template and customer journey podcast episode. Setup includes having infrastructure in place to measure your marketing and define your KPIs. Measurement is essential because you cannot create this data later. Use the See, Think, Do format to organize your KPIs based on the customer journey stage your prospect is in. Reference podcast episode 4. Within setup, align your content and channels with one persona. Having a customer journey here helps you further personalize your marketing to an individual persona. Reference podcast episode 5 on how to align content and channels. Finally, establish an on-going program. Iterative Marketing does not work with a time-boxed campaign. Programs are on-going marketing activities that can be continuously improved. Reference this blog on minimum viable marketing programs or this podcast. Reporting is connecting the dots between marketing and revenue. This is an important topic for marketers to prove their value to the C-suite and executives. With KPIs and measurement in place, you can format your reports to prove ROI. Also make sure you include long-term assets in your reporting. Iteration is the continuous improvement of your marketing. It is done by executing A/B experiments to identify opportunities for improvement. Review podcast episode 7 on designing an effective marketing experiment and this blog how to ensure your A/B testing get results. Next week, we will discuss breaking down the silos between marketing and sales.